I found this press release for this fun contest online today. If you have never tried Pocky, you don't know what you're missing. Introduced in Japan these light, tasty pretzel-like sticks are dipped in a variety of flavors. There's really no American treat anything like them. I was introduced to them a few years ago from my sister's Japanese exchange student, Yukiko. She still sends packages to my sister at Christmastime and I'm often lucky enough to have some passed on to me. I'm also thrilled to learn that they can be found in the Chicago area at Costco stores in addition to being available online at Amazon. Be sure to check out the contest, which runs through November 15. 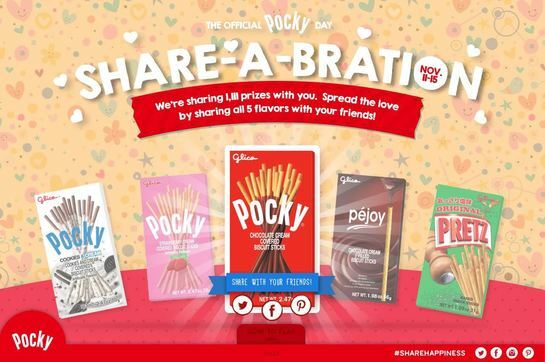 Irvine, CA – Ezaki Glico U.S.A., maker of the Pocky brand of snack products, has just announced its upcoming Share-A-Bration contest, officially launching on November 11th and ending on November 15th. This latest “Share Happiness”-themed endeavor from the makers of the incredibly popular, chocolate-dipped treats has been designed to coincide with the brand’s annual customer appreciation day – which always occurs on 11/11, due to the snacks’ uncanny resemblance to the number 1. The Official Glico Stick Day – also nationally recognized as Pocky & Pretz Day in the company’s home country, Japan – will kick off by giving fans the opportunity to win one of 1,111 possible prizes, the largest amount the brand has ever offered. Beginning at 12pm PST on November 11th, snack fans can log onto a number of Ezaki Glico U.S.A.’s social media sites – Facebook, Twitter, Pinterest, or Instagram – and simply “like” or “follow” their popular Pocky snacks. From there, participants will be guided to the Share-A-Bration contest’s official site, also found by clicking http://sharepocky.com/stickday, where they will have an opportunity to “share” a box of one of five delicious stick-shaped treats from the brand, including three flavors of Pocky, Original Pretz, and chocolate-filled Pejoy (the latest snack addition to Glico’s lineup). Each time a box is “shared,” contestants will receive notification if they have won or need to try again. Contestants can play up to five times in one day, with an opportunity to start fresh each day until the Share-A-Bration ends. Possible prizes, awarded at random to lucky winners, include a Pocky Power Bank for charging smartphones, a compact Pocky Speaker, and a handy Pocky Towel. Ezaki Glico U.S.A. corporate offices are in Irvine, CA and they adhere to the Ezaki Glico philosophy “A Wholesome Life in the Best of Taste.” Please visit the website glicousa.com or pocky.com. Pocky was developed in Japan when the idea was suggested of coating the already popular Pretz, a pretzel-like stick snack treat, with chocolate at one end so that they could be held without having to worry about the fingertips becoming soiled. At first the sticks were manually dipped. However, as demand increased, the innovation and creativity of engineers was fired up to develop a “Glico-Original” manufacturing plant. Pocky flavors in the U.S. are Chocolate, Strawberry, Matcha Green Tea, Chocolate Banana, Cookies & Cream, and Milk Chocolate. Pejoy, introduced last year in the U.S., are crispy cookie biscuit shells filled with rich, smooth creams: Chocolate, Matcha Green Tea, and Cookies & Cream. Pretz flavors are Original, Pizza, Hot Chili Salad, Sweet Corn and Tom Yum. Glico caramel – the company's first product – incorporates the innovative creativeness of Mr. Ri-ichi Ezaki, the company's founder. Ever since the beginning, the entire staff has likewise been heartily dedicated to further enhancing people's health and quality of life. This has led to the expansion of business lines beyond confectionery to include ice cream products, processed foods, desserts, milk products, baby formula, food ingredients, and raw materials for cosmetic and health products.